The filter drawer is a very reasonable alternative to the filter wheel for convenient changeing of filters. If a high time resolution is not the most important thing, the manual change of the filters usually is enough. All parts of the filter drawer system are made of aluminium and brass, no plastic parts (bysides the knob of the drawers). All pieces are black anodised. Only stainless screws made of V2A are used. The filter drawers are also made of aluminium. No unwelcome infrared can reach the chip - how it would be possible with plastic drawers. The drawers with the filter are fixed in the correct position, without a fastening screw be the meany of a small adujstable spring loaded ball. After each change, every filter will be right back at the same position. The drawers are designed in such a large way, that it is possible to use all sizes of filter up to a diameter of 2" or 50 x 50mm². There is a wide range of drawers available to be able to mount nearly every diameter found on the world. 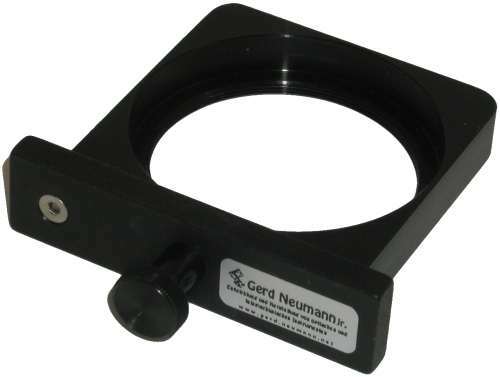 The filter drawer has an optical depth of 22mm and due to that fact, can be used also at scopes with a high focal ratio. The main body of the filter drawer system is avaiable with a wide range of threads. 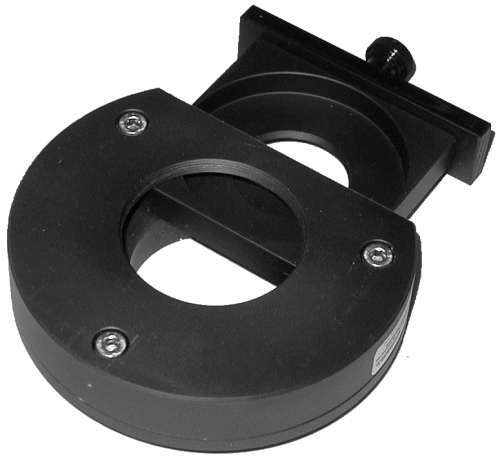 Versions with mounting holes for SBIG cameras (classic body) is also available. 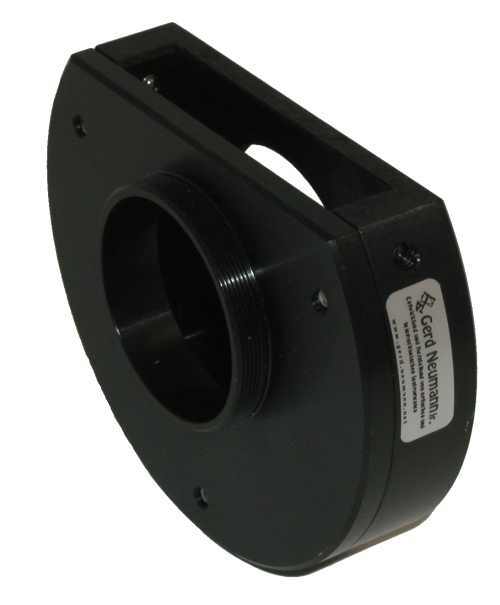 If you use a mainbody with a female M48 thread on the telescope side, you can use your older lenses from Olympus and Nikon with your CCD camera with the filter drawer system. Mainbodies with a Canon EOS bajonett are also available. You may use your Canon lenses on your CCD camera and you may switch filters! We do need to know some specs to reach the correct backfocus. Appropriate adapters to 2" and other fittings are also existing. It is possible to work with the mainbody and one drawaer only, but this doesn´t make too much sense in my eyes: You have to screw and unscrew the filters at each change. I do recommend getting as much drawers as filters are in normal use plus the matching storage boxes to keep them free of dust and moisture. There is also a blind-plug available to close the mainbody when no drawer is used.